Prince Harry's blue blood suede shoes? More British royal-watching sparked as Harry shows off his reggae dancing skills in Kingston, Jamaica while sporting some trendy blue suede shoes. 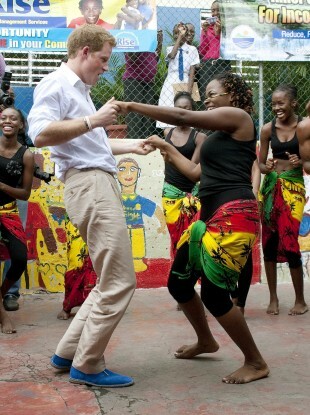 Prince Harry dancing in his blue suede shoes with Chantol Dorner in Jamaica. THE BRITISH PRINCE Harry’s are more Memphis, Tennessee than Jamaica – but the prince’s blue suede shoes served him well as he danced his heart out in Kingston yesterday. His choice of footwear is the latest headline grabbing incident on his royal Caribbean trip. Earlier this week Prince Harry was able to out run Usain Bolt, the fastest man on earth, in a race. The 27- year-old, who is on an official visit to the Jamaica, was visiting the Rise Life project in downtown Kingston when Dormer propositioned the prince for a dance. He was pulled to his feet and made to dance to the reggae song Bob Marley’s One Love. Harry also met with children and staff of the project, which helps young people in deprived districts of Kingston. Out of respect for the six British soldiers reported killed in Afghanistan yesterday, Prince Harry’s modified his tour schedule. While visiting a military camp in Jamaica it was planned the young prince would rappel down a new training wall at a Jamaican military camp. However CBS news has reported that Prince Harry decided not to take part in the military activity. Harry is scheduled to travel to Brazil after he departs from Jamaica on Thursday. Email “Prince Harry's blue blood suede shoes?”. Feedback on “Prince Harry's blue blood suede shoes?”.